Do you like Magic Jewels? Share it with your friends. 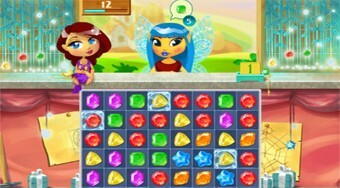 Magic Jewels is a very catchy logic game in which you have prepared a total of twenty different levels of difficulty from the fairy store environment. In each round, combine at least three of the same colored gemstones to collect the amount they require that your shoppers want in the form of cute fairy.